So you want to play Tiger Woods' irons, but you don't quite have Tiger Woods' game? These irons were made for you. No, they are not for beginners - more for better players that want a tour-quality golf club, with a little bit more forgiveness than those hard-core blades the pros play with. The iron is a forged CNC-milled 1025 carbon steel. (This is the gold standard in high end golf clubs.) It is a forgiving cavity back but very shallow, thus it still can be manipulated and has good workability. The coolest thing about these irons is the split back. This design tucks weight behind the sweet spot, and the center of gravity as well. The sole of the club is wider and slightly larger than Tiger's VR Forged TW Blade, and it is cambered to produce solid contact from various lies. I would recommend this club for the low handicapper that is not ready for blades. 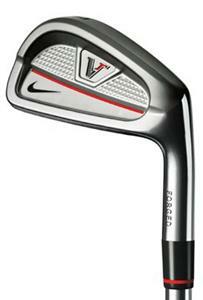 You get a more forgiving club, but just as workable as the blade. The only difference I can tell: for the purist, you probably won't be happy with the feel and sound when you hit it solid. Let's face it -- when hit on the screws, nothing feels as good as the blade.